Boston, MA — An infuriating video was uploaded to Facebook this week showing an off-duty Boston cop tackling a small older man in a fit of road rage. According to multiple witnesses, the cop nearly hit the older gentlemen as he drove through a crosswalk. After almost being run over by the incompetent cop, the older man, who was on foot, simply tapped the cop’s window with his umbrella to alert him to the fact that he nearly hit him. This tapping on the window set the cop off into a fit of rage, leading to him chasing down, tackling, and assaulting the innocent man. When the older gentleman saw the raging lunatic jump out of his vehicle and chase him, he naturally ran. This set the cop off even more, and when he finally caught up to the man, he tackled him, shoved his face into the pavement, and put his knee in his back. The video, taken by a vigilant citizen, Stephen Harlowe, starts as the cop is ramming the man’s head into the sidewalk. 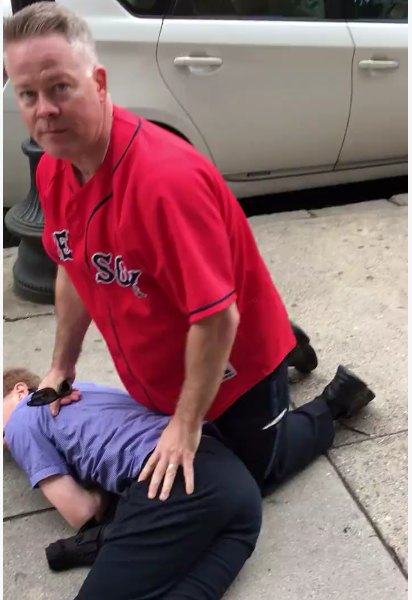 According to Harlow, and the video, the man wearing a Redsox jersey who identified himself as a ‘Boston police officer,’ refused to provide his name or badge number. During the entire melee, the man identifying himself as a cop was asked to show his badge multiple times and he refused. Since he refused to identify himself, it would have been interesting to see what would have happened had concerned citizens jumped in to protect this older man from his assailant. As if nearly running over an elderly pedestrian, chasing him down, tackling, and assaulting him wasn’t enough — this cop called for backup to have his fellow cops help him in the process. Almost immediately, nearly a dozen cops show up to help their buddy in his fit of rage. The witnesses are all but completely ignored as the cop explains that he likely ‘feared for his life’ when the older gentleman tapped on his window with his umbrella. There was zero damage to the cop’s car, yet the off-duty officer attempted to describe the scenario as if he was the victim. According to Harlowe, the cops refused to take witness statements regarding the tackling of the man in spite of his multiple wounds suffered at the hands of one of Boston’s finest. Eventually, according to Harlowe, the man would be let go as there was zero evidence that he committed a crime. Sadly, however, the one who did commit a crime will be back on the streets wearing his full uniform to protect and serve the citizens of Boston. The Free Thought Project contacted the Boston Police Department to find out if they were aware of this video. We have yet to receive a response. Below is a perfect example of abuse of power and subsequent acceptance of it by peers. Had an average citizen tackled a man for tapping on their window, they would undoubtedly be facing assault charges right now. Instead, this power hungry public servant is considered the victim.